Please follow the instructions below when shipping DNA samples to ACGT, Inc.
ACGT, Inc. accepts samples Monday through Friday from all carriers and on Saturday from Fed-Ex. To ensure your samples are received on Saturday, please mark “Saturday Delivery” on the Fed-Ex Airbill. The order form or a detailed description of the submitted samples must be enclosed in the package. Processing of any shipment without proper paperwork will be delayed. DNA samples in tubes may be shipped at room temperature for overnight delivery. It is not necessary to send the samples on dry ice or wet ice. Template DNA stored in individual tubes should be capped tight to prevent accidental spillage or cross contamination. DNA shipped as a pellet or in EtOH can be also shipped at room temperature. 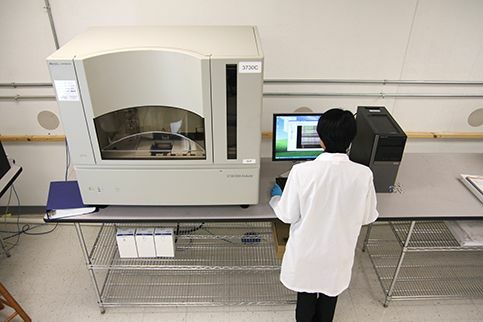 For Same-Day Service, DNA samples must be sent by Fed-Ex First Overnight. Please view the Fed-Ex Airbill carefully. For Standard service or Express Service, DNA samples can be sent by any type of overnight delivery. Please ship the DNA samples with adequate padding to prevent any damage during shipment. We provide bubble bags for your shipments. Please request bubble bags if you need them for your future orders. It is necessary to freeze the samples and ship on dry ice. Pack the plates, while still frozen on dry ice, in a Styrofoam box. Make sure there is enough dry ice on the top, bottom, and both sides of the plates. Plates should be sealed properly with a polystyrene sealer to avoid accidental spillage or cross contamination. If shipping more than one plate, wrap the plates in aluminum foil and/or vinyl tape (not lab tape) so they will not move around during shipment. Lab tape will become brittle and rip when exposed to dry ice. Wrap the edges of the plates with parafilm and place them in the container, with the lid side down. Packed with protective bubble pad. Wrap the edges of the lawns in parafilm. Pack agar lawns in a styrofoam cooler. Plates should be cooled to room temperature to prevent condensation. Once the plates have cooled, place them in the cooler with the lid side down. Place ice packs in the cooler. Do not place ice packs directly on plates as condensation may leak into the plates. Make sure there are “THIS END UP” arrows on the box.